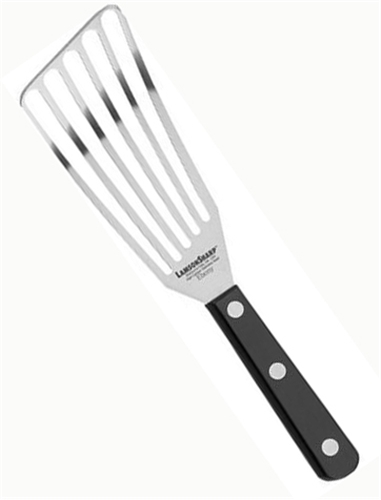 The best fish spatula and chef's slotted turner for right-handers has tempered high-carbon stainless steel blades that are perfectly tapered, making it the best tool for many uses. It is designed to flip delicate foods. The turner is lightweight, and razor-thin, so it can flip eggs, fish, and crepes. It is also strong enough to lift heavier foods like hamburgers. The long slots allow excess grease to drain. Made by Lamson & Goodnow in the USA.